We made it through the night, woken after a short nap by excited middle-aged French men setting up their camp next to us. Unlike us, they’d (already started drinking) calculated exactly 1km out from the summit of Le Col de la Criox de Fer – the highest uncategorised climb before the Alpe d’Huez. Stage 19 bought many surprises as the barricades went up; markers determined the route and the crowds flooded in. The crowd sets up for a day of racing. Parked on the side of the course, we were flanked by clusters of motor homes decorated with flags and groups of men with megaphones, horns and whistles. With less people around us than previous days, we went home with half the caravan spoils in the back of our car and some quality video footage before both our cameras and phones died from battery loss. The climb up for the last kilometre. 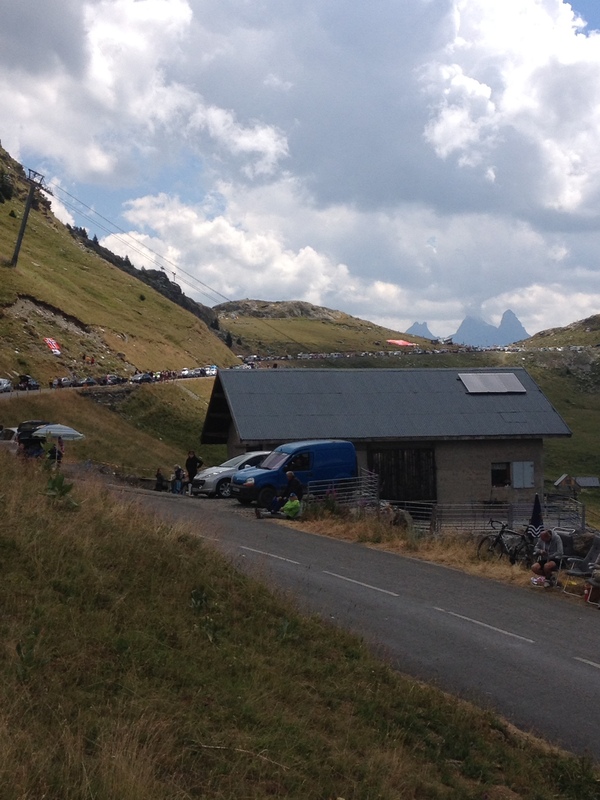 As the riders came through, surprisingly Froome was on the chase – Nibali had just taken an unsportsman-like advantage whilst Froome had a mechanical issue just down the road from our viewing point and he was keen to make up the ground. Behind schedule, the race was slower on Friday than in previous days and the course was much more spread out over about forty minutes of racing. 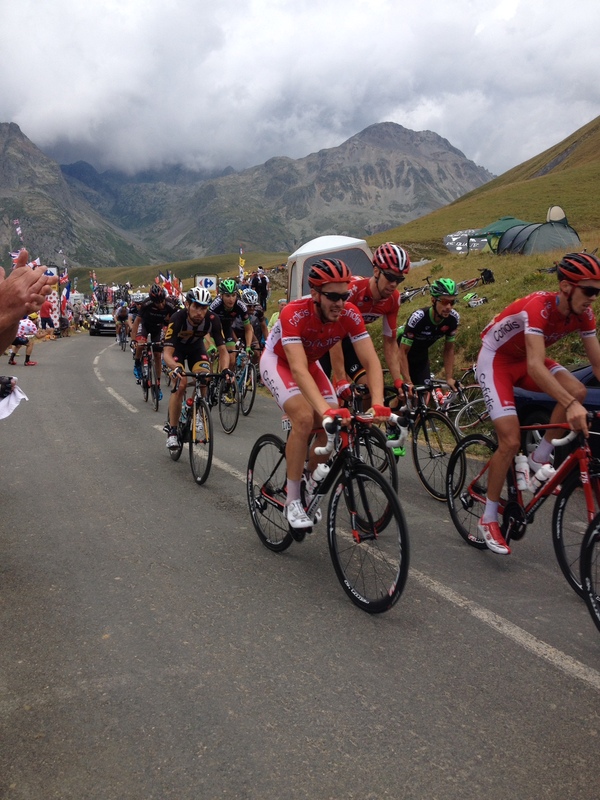 The peloton make their way slowly toward le col de la criox de fer. Getting tired, riders slowly make their way up, up, up. The last of the riders – Greipel- makes his way up the mountain. After the stage we needed to down the mountain quickly. We had a five-hour drive into Italy ahead of us, staying the night in Turin to break up the long drive back to Nice. Sadly to make the final stage in Paris on Sunday, we would miss the penultimate stage on the Alpe d’Huez where the race would be set. Driving in bumper-to-bumper traffic following the course, thousands lined up down the mountain for approximately two hours until we made it onto the virtually abandoned highway to Turin. It’s abandonment was simple: the tolls. We spent 55 Euro in total getting to Turin in what took almost six hours. 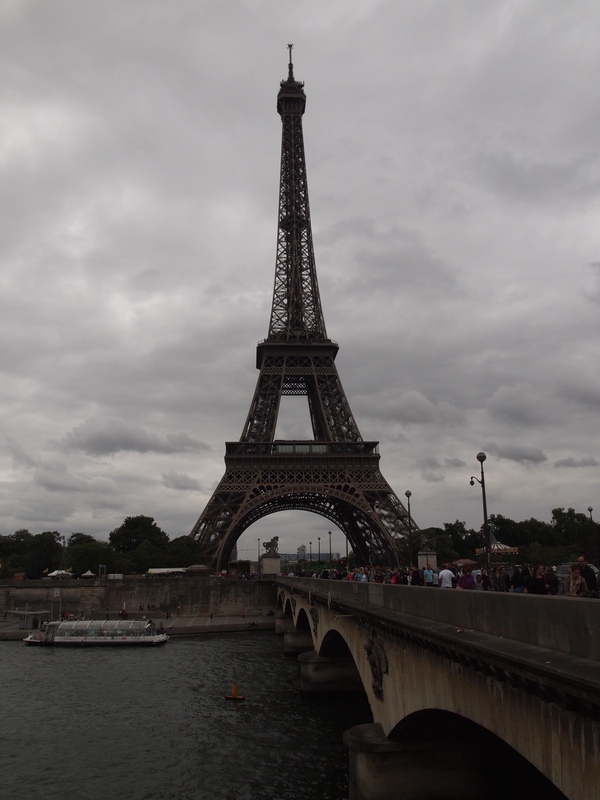 We arrived in humid conditions smelly, warn and tired around midnight and were happy to wave goodbye to the Italian boarder a few hours later at around 9am the next morning to fly from Nice to Paris for the Champs Élysées. We ended up driving about 2000 km in five days. 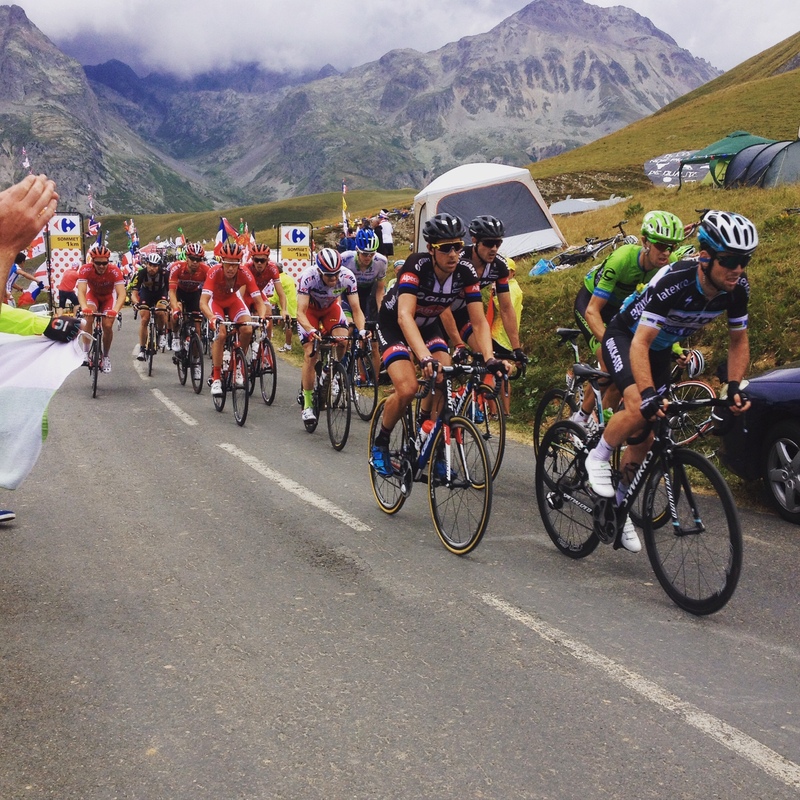 Next, we see some women’s racing amidst Paris chaos, rain and the final stage of Le Tour for 2015. 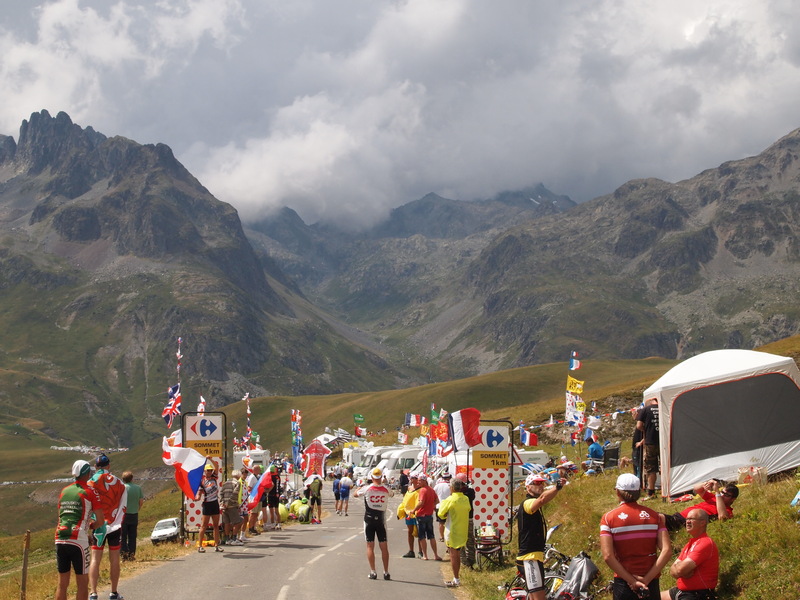 ← Le Tour de France 2015: Stage 18 Gap to Saint-Jean de Maurienne.